Crystal healing properties unique to moonstone is its lunar energy and its talent to balance emotional upsets. Moonstone has gentle energy (sometimes referred to as feminine or mothering energy) that helps to ease stresses and feelings of anxiousness. It can be used to enhance intuition. Moonstone is a good crystal tool for anyone who wishes to reflect on past circumstances to learn life lessons from. It is also useful as a manifesting tool, drawing in those things you most desire. 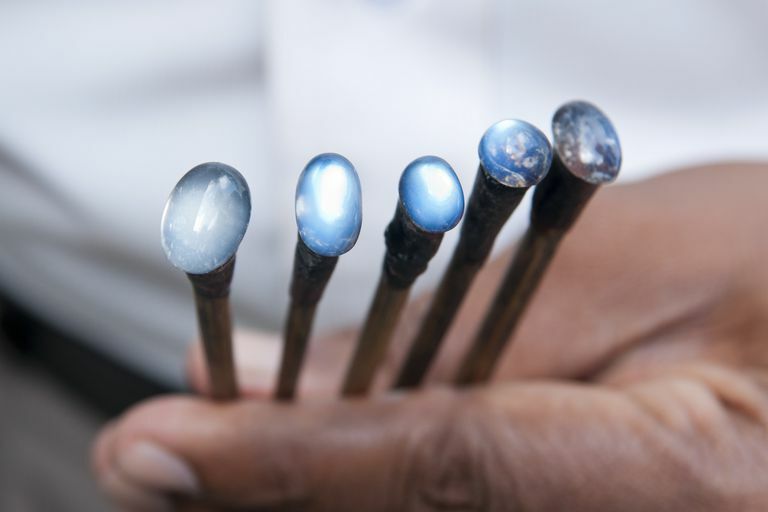 Telepathy - Blue moonstone helps facilitate telepathic communicates and assists in communications in general. Second Sight - Grey moonstone assists clairvoyance, also clearing away mental confusion. Emotional Healer - Peach moonstone is an emotional healer. Shield or Guard - Rainbow moonstone (white labradorite) protects against psychic attack. Promotes Spiritual Growth - White moonstone facilitates spiritual growth. Balancer - Yin yang balancer. Everyone carries both masculine and feminine energies, moonstone can help create a balance between these polarizing emotions. The Amulet Manuel, Kim Farnell; GEM Stones A to Z, Diane Stein; Gemisphere Source catalog.